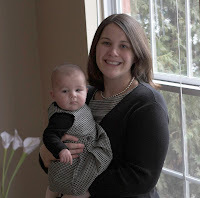 It was finally cold enough today for Eleanor and I to wear our matching church dresses. I've been waiting for this Sunday to come since about mid-December when I found the dress for Eleanor that matched one I already had. I thought it was so fun that we were dressed alike today. I can't say as though anyone really noticed until I pointed it out, but then of course they thought it was adorable. (Okay, they didn't say 'adorable'. They just kind of went, 'Ahhh.') I've finally got a way Eleanor can be like me that Jared can't touch. I don't think he's willing to wear a dress and tights. We tried a new church today, and we liked it pretty well. The people were very nice, especially the ladies in the nursery, which is very important to us. Eleanor kept grinning at the lady who was watching her. When we went to pick her up she looked like she was really having a good time. We'll probably go back next Sunday. I hope we find a permanent place to go soon.